Researchers from Tel Aviv University have engineered the world’s first perfectly functioning, immunologically, cellular, biochemically and anatomically matched 3D printed heart. The heart is vascularised and supplied by the blood vessels of the patient and is created from the patient’s own cells. 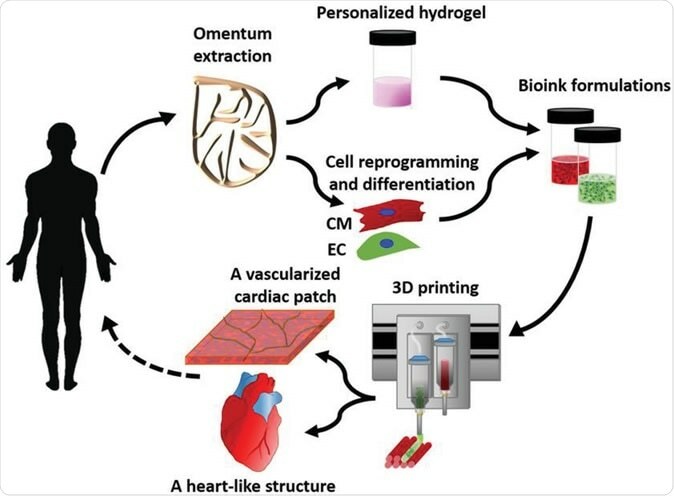 The results of this medical breakthrough study titled, “3D Printing of Personalized Thick and Perfusable Cardiac Patches and Hearts,” were published in the latest issue of the journal Advanced Science this week. 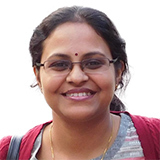 Researchers explain that till date scientists have been able to print simple tissues using the 3D printing technology. These simple tissues were devoid of blood vessels and thus could not be used for much vascular tissues and organs such as the heart. Millions of people around the world suffer from heart ailments that may require heart transplants. This has been near impossible due to the shortage of donor hearts and also due to fear of mismatch of tissues of the donor and the recipient. This mismatch often leads to rejection of the donated heart by the recipient and thus can lead to failure of the transplant. This new study shows that if 3D printed hearts could be created from the patient’s own cells and transplanted, there may be a better chance of transplant success. Imaging of the heart and patch modeling. CT image of a) a human heart and b) left ventricle coronary arteries. c) A model of oxygen concentration profile in an engineered patch. d) Replanning of the model showed better oxygen diffusion, sufficient to support cell viability. Prof. Tal Dvir, lead researcher of the study from of TAU's School of Molecular Cell Biology and Biotechnology, Department of Materials Science and Engineering, Center for Nanoscience and Nanotechnology and Sagol Center for Regenerative Biotechnology said in a statement, “This is the first time anyone anywhere has successfully engineered and printed an entire heart replete with cells, blood vessels, ventricles and chambers.” “This heart is made from human cells and patient-specific biological materials. In our process these materials serve as the bioinks, substances made of sugars and proteins that can be used for 3D printing of complex tissue models. 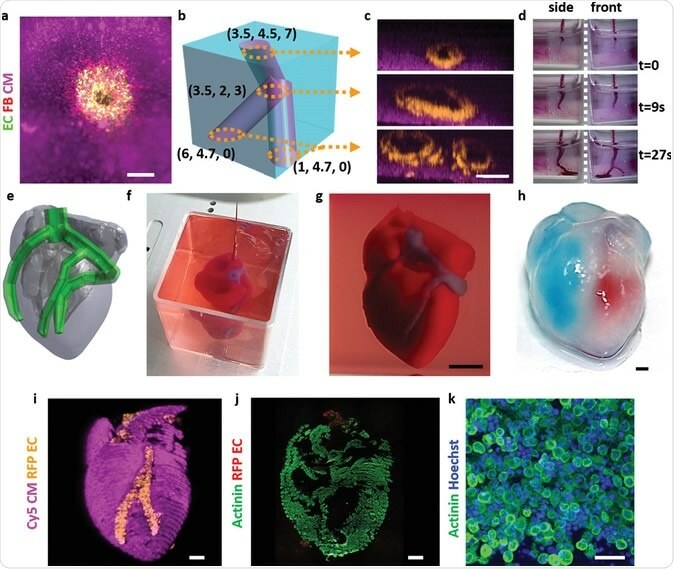 People have managed to 3D-print the structure of a heart in the past, but not with cells or with blood vessels. Our results demonstrate the potential of our approach for engineering personalized tissue and organ replacement in the future,” he explained. Printing thick vascularized tissues. a) A top view of a lumen entrance (CD31; green) in a thick cardiac tissue (actinin; pink). b) A model of a tripod blood vessel within a thick engineered cardiac tissue (coordinates in mm), and c) the corresponding lumens in each indicated section of the printed structure. d) Tissue perfusion visualized from dual viewpoints. e–k) A printed small‐scaled, cellularized, human heart. e) The human heart CAD model. f,g) A printed heart within a support bath. h) After extraction, the left and right ventricles were injected with red and blue dyes, respectively, in order to demonstrate hollow chambers and the septum in‐between them. i) 3D confocal image of the printed heart (CMs in pink, ECs in orange). j,k) Cross‐sections of the heart immunostained against sarcomeric actinin (green). Scale bars: (a,c,h, i,j) = 1 mm, (g) = 0.5 cm, (k) = 50 µm. The team took fatty tissue from the patient for their study. Then they separated the cellular from the acellular tissues. The cells were now made into pluripotent stem cells. This means they could now be moulded into becoming any cell of the body. Now a three-dimensional network of extracellular macromolecules called the extracellular matrix (ECM) was created using collagen and glycoproteins. There was also a personalized hydrogel printing “ink”, explain the researchers. After mixing with the hydrogel, the cells could now be separated into cardiac or heart cells and endothelial or blood vessel cells. This helped create patches of heart complete with blood vessels. Using the same method whole of the heart was created with blood vessels. Prof. Dvir explained that the technique used native patient tissues and materials and this was crucial to the study. Prof. Dvir said, “The biocompatibility of engineered materials is crucial to eliminating the risk of implant rejection, which jeopardizes the success of such treatments. Ideally, the biomaterial should possess the same biochemical, mechanical and topographical properties of the patient's own tissues. Here, we can report a simple approach to 3D-printed thick, vascularized and perfusable cardiac tissues that completely match the immunological, cellular, biochemical and anatomical properties of the patient.” As a next step they have make the 3D printed heart to actually behave like the heart for a successful transplant.